When you're 20, you want to save the world. When you're 30, you settle for saving yourself. Woman, in my thirties, I've finally found what gathers my passions: Personal Development. Personal development, most of all. This is a tool for me to reflect and to improve myself. I don't feel entitled to give lessons or tell anybody what to do. My purpose is to share my thoughts. They say it helps. If you can find something interesting or useful for you too, I'm happy. Some time ago I started thinking: yeees, it would be nice to put all these chunks of personal development into a blog. And then everyday I found perfectly valid excuses to postpone it: naah, today I'm tired, I'm not inspired, it's sunny, it's cloudy, too much work, I have to put the 200 shirts in my wardrobe in chromatic order, and what should I start with?, etc. Thinking about it, I could have drafted a list of them, they were so pertinent. And then days went by, the ideas where still there in the back of my brain and the blog had not seen the light. And then...well, something happened. I couldn't call it an epyphany, it was just a small event. One day, I will tell you the full story. For the moment, let's say that, even if I still had a looong list of excuses to postpone it, I thought: here is the perfect subject to start my blog: procrastination. Let's go live. Procrastination. Ever heard of it? 4) your life is already perfect and this blog is of no interest for you. Good for you. If instead you looked at your shoes and tried to camouflage yourself in your armchair, don't worry: you belong to the 99,99% of the population who has an imperfect normal life. And if you are still reading, you may belong to the millions of people who want to improve their life. Because when you are 20, you want to save the world. Or to make it a better place. Well, that's what you claim even if you are 40 and you live in the silicon valley, but ok. Anyway, if you are more than 30 and you are not a silicon valley tycoon, you will probably have enough with saving yourself. And making your life better. The good news is that you can find some tips here to start doing it. So, let's start, I've procrastinated enough. Well, you could say that procrastination is an art and that you procrastinate because you are creative or because you have a busy life. Believe me, these are just small lies, excuses to justify yourself. In archaic words, it's bovine defecation. Procrastination is a weakness that we all experience and which brings us to postpone something that we have to do but that is a pain in the neck. It can be anything, big or small. Cleaning your desk, studying for that exam, writing that complaint to that jerk of the service provider, starting looking for an apartment to buy, starting making some exercise. The problem is: you want to do it. Or you have to do it. In any case, you know that once you have done it your life would be a bit better. And there is nothing preventing you to do it today. Then, why don't we do it? Easy: for one reason or the other it's painful. It costs energy. And so we find a lot of excuses to postpone it. But. There are some "but" s. But the thing you are postponing is still there. But it's sucking your energy. But you may have consequences if you don't do it now. Let's say you have to write a complaint to that jerk of the service provider. Classic situation: he messed up, you asked for explanations, he shrugged and said that he has done his work properly but you are not happy with it. And you have to spend time and energy to write a complaint. That complaint stays in the back of your brain until you have sent it. It creates concern, burns energy and occupies RAM. Yes, your brain works like an hardware and part of its memory is busy with that complaint. Even if you keep yourself busy, there is that little voice inside your brain which says "hey, you still have to write that complaint". Ok, how can I get over it? First thing, write a to-do list. I know that you have all that stuff in your mind. But if you put it on paper, your brain will be unloaded. Therefore, put all the things you have to do on paper and rank them in order of priority. Don't cheat. Your brain knows what you need to do first and will hunt you if you put it at the bottom of the priorities. Focus on your first priority. If it's something big (for example finding an apartment to buy), split it in sub-processes and detail them on paper. Then ready, steady, go! Do it! Yes, I mean now. No, your facebook status is not priority. Don't do anything else until you have done it. Done? Ok, then thick it in your to-do list. Or even better, strike it through. Heavily. How do you feel? Relieved, isn't it? If it was a pain somewhere else than in your neck, you may even feel your muscles relax and your brain floating. It may be that "cigarette" that you smoked before starting. Or it's just your brain that makes you feel that you have done the right thing. It releases in your body all the good stuff that makes you feel better. You have made your life a little bit better. Happy? Proud? Yes, I see you smiling. And for a topping on your unicorn feeling, give yourself a small reward. Take a drink from the fridge, eat that chocolate, anything that is a reward for you and that is proportional to what you have done. Celebrate your small success. You will thus reinforce that good feeling. 10 things you should have for breakfast. You will never imagine number 7. Looking around on the web, on news and social networks you will probably have seen so many articles about the importance of having a good breakfast and what you should or should not have for starting the day well. In particulart in the last times, facebook - just to name one - proposes me at least one article a week about this subject. It usually comes from the Huffington Post...by the way, if any of you knows how to filter it out, please let me know. Their titles are very intriguing, I would even define them fire alarm questions, then I open them and they say such trivialities that they make me feel so stupid for having opened them. So you could wonder: do we need another article about this? No, indeed you don't need it. So why am I wasting your time - but also marginally my time - talking about such a banal and hackneyed subject? Because it's for sure hackneyed, but it's not banal at all. As my husband says, (finally) a useful post. No, just joking. He just said it may be worth sharing this recipe with you: homemade breadsticks. 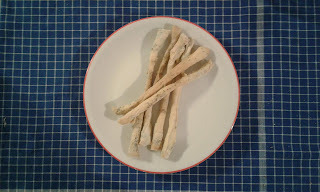 Grissini in Italian. Have you ever found yourself found yourself with some friends coming for lunch, no ideas for an appetizer, no time to go foodshopping and no time to do elaborate things? If the answer is yes, you are probably the parent of a baby. Welcome to the club, just know you are not alone. Jokes apart, I often find myself getting peckish in the middle of the morning or afternoon. Or after dinner. Yes, I am often peckish. I have started this post some months ago. I have drafted it, thought a lot about it, changed it, deleted many paragraphs, rephrased ideas... In short, it's a difficult one. You might be surprised by the title of this post. If you browse the thousands of blogs and articles on personal development, you will find plenty of useful tips on how to develop resilience, strategies to forge your stamina through the fires of hell and slogans to never, never, never give up. They can be very useful. Why this title then? I find it's easy to follow the mass and encourage people to develop resilience and go go go and conquer the world. But in the end you have to be honest, at least with yourself: can you go on forever?